The bar vets behind popular Chicago watering holes Ludlow Liquors, Sportsman's Club and Estereo are at it again. Young American opens Friday in the storefront formerly occupied by Johnny's Grill, at 2545 North Kedzie Avenue. 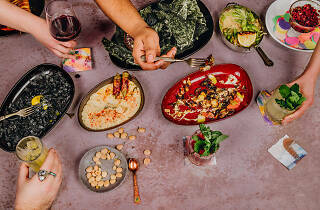 Beverage director Julia McKinley's (Lost Lake, Milk Room) drink menu offers some exciting options: In addition to wine and beer, there are eight boozy cocktails and three spirit-free sippers that guests can opt to add CBD to for an extra cost. (For the uninitiated, CBD is a calming, non-psychoactive concentrate extracted from cannabis plants. It's legal, and it won't get you high.) The alcohol-less Honey Do sounds particularly appealing, with Schizandra berry tea, star anise, lemon, bee pollen and honey. On the food front, chef Nick Jirasek (Old Habits at Ludlow Liquors) "channels America's radically diverse food cultures without the restraint of regional authenticity," resulting in dishes like the goth bread, with activated charcoal, leek ash, cheese, "nighttime sauce," smudge butter and egg yolk. 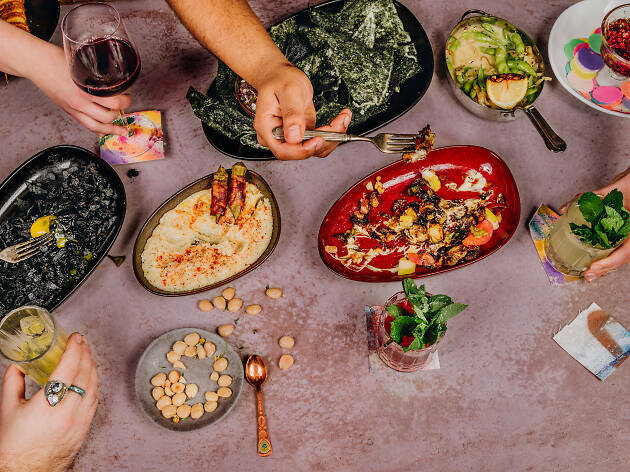 Other highlights include the lamb tartare with black cardamom, the pickled okra with popcorn grits and Brussels sprouts, which are gussied up with juicy grapefruit wedges. The space itself is brimming with thoughtful touches and works from local artists. Take a spin around your barstool to spot photography from Paul Octavious, ceramics from Leah Ball and fabric panels from Alyx Harch. Fans of the old Johnny's Grill will have to do a double-take: The space looks quite different with antiqued French wall panels and stadium seating for the post-work crowds. Have a look for yourself on Friday, when Young American opens in Logan Square. In the meantime, peep menu items and cocktails below.